box and pen so they can see for themselves. That is the way all of the soldiers get it. They do not know that we are here, or have been fighting for all of them. Well that is all about the pen. in the town but now I think there is no bed like that one and I sure will know how to like some things like that. I have laid in mud and slept all over. When I get home, don’t say anything if you see me sleeping on the floor because I can sleep anywhere if there is no shooting or any airplanes bombing. Those two things will keep me from sleeping and you know that the kids [used to] wake me up if they looked at the house. Well Mother, this is all for this time, and hope you are feeling fine and thank you for the box and hope I am soon home. I got the paper but no letter for two or three weeks. Well keep on writing just as if I was not coming home at all. What’s the big deal about the pen? What a bittersweet Christmas for Glenn! The war was over, but he was still not home, and to top it all off, he did not have a reliable pen to write with. This letter was not the first time that he mentioned the pen that his mother sent him. She had purchased a Parker’s pen, and without checking the contents, mailed the pen to Glenn. However, when the pen box eventually reached Glenn on the German Front Lines, he discovered that the pen inside the box was actually different brand. This small mistake did not seem like a big deal to me, but the more he agonized over the pen, I realized that this was actually quite a big deal for him. He likely did not have a good pen to write with, and because ink was in short supply, other soldiers were likely reluctant to share their ink pens. Although the two pens seem to have been about the same price, Glenn did not like his Swan pen, and if he wrote this letter with his new pen, it does not seem to write smoothly. He likely didn’t know how to refill it, either, without the instructions. His pen was his only way of communicating with his family (remember, no phones or internet 100 years ago! ), so this small thing was actually a big problem for him. I can now understand his frustration. 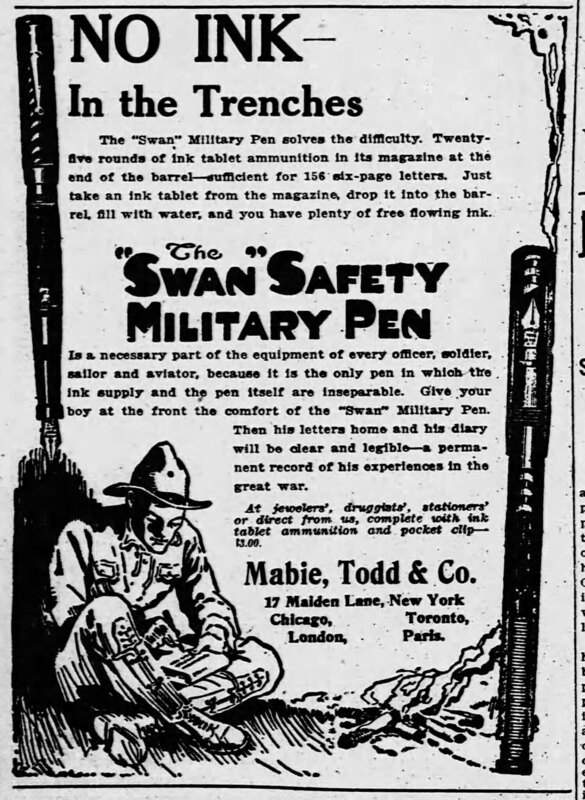 I wonder if the merchant was knowingly selling Swan pens in another pen’s box, or if it was an honest mistake. I also wonder if that merchant got an earful by the time that Glenn got back that spring, or if the matter had been forgotten by then! I hope that Glenn was able to secure a better pen for the rest of his time in the Army, and that he was able to write home as much as he wanted. “Outside of the pen,” Glenn’s Christmas presents were quite a treat! Candy, gum, and Mother’s homemade cake! His Christmas must have been bittersweet. I imagine that he would have been grateful during his future Christmases, when he slept in a warm bed with quiet nights, had a hot home-cooked dinner, and could spend time with family. This is the most animated Glenn has sounded in his letters. That Christmas package really meant a lot to him! As for the pen fiasco, I’d say that the Swan pen probably sounded better in theory than it actually worked in practice. And I’ll bet it leaked.